One of the things that interested me since the very beginning of my Lean experience 20 years ago is the relationship between leadership behaviors and information flow. More recently, I have also become interested in the time function of leadership – basically, fundamental leadership beliefs linked to behaviors that slow things down (in a negative way) or which speed things up (in a positive way). Focusing for the moment on leadership behaviors, the image at right shows a construct that I developed in 1996 and wrote about in a 1998 paper titled “Lean Behaviors.” I was obviously inspired by Taiichi Ohno’s characterization of work, and recognized that the exact same construct held true for behaviors as well. This new perspective on leadership behaviors was a revelation with great practical importance. It turns out that value-added behaviors and behavioral waste are very easy for people to identify, while the gray area exists because like work processes, people’s behaviors when interacting with others are not perfect. Nevertheless, the major contours of how leaders should behave and not behave in the context of Lean management were now clear. In the paper, I described how organizations would not succeed in their Lean transformation, and would not be able to create a Lean culture over time, if the leaders’ behaviors were inconsistent with Lean. This happens to indeed be the case. As we look back over time, we see that the best Lean transformations are the ones where leaders consistently exhibited lots of “Lean” behaviors and little or “fat” behaviors. The connection between leadership behaviors and process was not recognized due to the lengthy and unrelenting focus on Lean tools. That’s a pity, because a lot of effort has been expended for many years by thousands of organizations with little result. “Fat” leadership behaviors are inconsistent with Lean management because they generate both task and behavioral waste, unevenness, and unreasonabless. Information that moves within and between people and processes comes disrupted and gets scrambled, resulting in time delays. As I said before, this is of great practical significance: Think, for example, of General Motors’ Cobalt ignition switch problem, created by leadership behaviors that blocked, disrupted, and scrambled information flows and consumed lots of time before action was finally taken. Most corporate failures, whether large or small, are the result of information flow problems. Likewise, most Lean transformation failures are the result of information flow problems. I have steadily improved and expanded my initial “Lean Behaviors” work over time, researching both what precedes behaviors (beliefs) and what comes after it (competencies followed by outcomes), resulting in a simple yet comprehensive framework for understanding and practicing Lean leadership. And I know it works because I have used it every day since the mid-1990s. Learn more in my workbook Practical Lean Leadership and in Speed Leadership. Together, the two books precisely define what it means to be a Lean leader. You can read the back stories to these two books here and here. It will help you better understand my work and its significance. 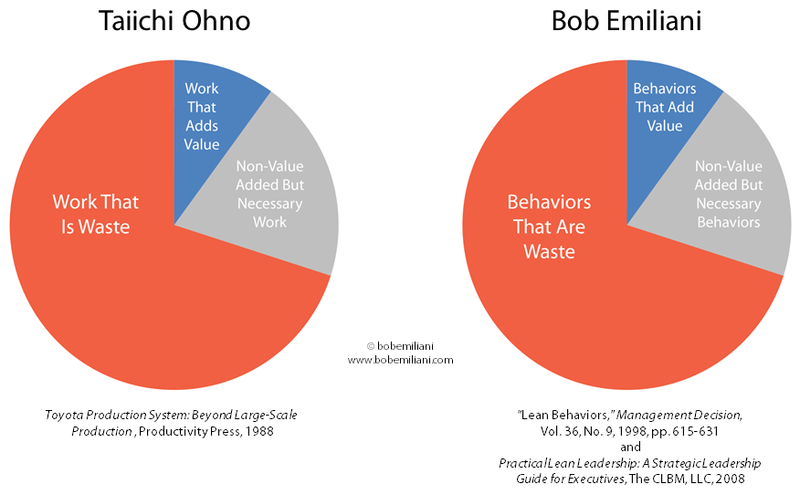 Please read the next post in this 4-part series to understand how behaviors is only the starting point for understanding what Lean leadership is: More Than Leadership Behaviors. It was an inspiring article. Thanks for sharing your wisdom. Truly , it make sense for any change happens in the Organisation. The primary factor to establish Organisation mindset to a path , where change is necessary.